In 2008, the Washington Post called Barack Obama the king of social networking. It wasn’t much of an exaggeration. He was the first American president to be elected largely on the strength of his online political campaign. The fact that he was eloquent, charming and good looking certainly helped – especially given what the US public had been subjected to for the previous eight years. His policies also made political sense. Unfortunately, he inherited a lot of problems that, I believe, curtailed his ability to keep a lot of his promises and reach his full potential. Now he’s in the middle of another political campaign and once again he’s using social media to aid his cause. But this time round the question is, can lightning strike in the same place twice? When President Obama launched his re-election campaign on YouTube earlier this year things didn’t look promising. The video was weak; it came across as tired; it seemed to tell the American public that things are only as good as can be expected and that the devil they know is better than the one they didn’t. 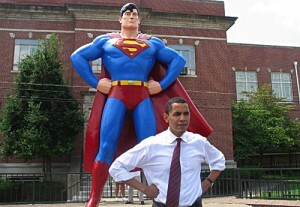 Since then Obama seems to have regained some of his flair. He’s still active on Twitter, Facebook, YouTube, MySpace, LinkedIn and assorted niche networks. And now he’s added Foursquare to his social media stable. Foursquare is the rising star among social media networks. Its membership is growing at a furious rate of knots and it’s evolving to meet new needs in its business and consumer base. In other words, it’s a force to be reckoned with. The idea is that Obama will sign in at various locations on his campaign trail, giving his followers tips, keeping them up-to-date on his activities and announcing upcoming locations to anyone who’d like to be there. Global Post reported that Foursquare already has a “Follow the President” banner on its homepage and that Obama already has 21 000 followers. Unfortunately for Obama, he’s not the first high profile politician on Foursquare. The mayor of New York, Michael Bloomberg, beat him to it, as did the mayor of Newark, Cory Booker. Even worse, one of the Republican presidential candidates, Mitt Romney, also pipped him to the post. The fact that he wasn’t the first on Foursquare is by no means a train smash. What is more worrying is the fact that after a spirited Twitter campaign to gain support for his plan to deal with the debt ceiling, Obama lost 37 000 followers. He still has over 9.7 million followers but that is beside the point. And the point is, over the past three years or so people have changed the way in which they use social media. They are far more engaged and they expect far more from the people they follow, especially public figures and brands. Obama wasn’t wrong to use Twitter to try and drum up support, but he should perhaps have used it with more caution. He should have respected his audience more. It’s a lesson he’ll have to learn if he wants to replicate his 2008 success. He’ll also have to adapt to the greater level of engagement. Fortunately, he has a crack team working on his social media strategy; a crack team that already has a solid base to build on. The team needs to stay on its toes, however, as the Republicans will also have learnt lessons from the previous campaign and are unlikely to nominate aging candidates with Neolithic dispositions. John McCain was notoriously computer illiterate and that hurt his campaign a lot. Almost more than Sarah Palin. Mitt Romney, he who was on Foursquare before Obama, has already spent $333 000 on his social media campaign, and is surrounding himself with his own team of social media experts. It looks as though the next year or so will be a very interesting one not only for American politics but for American politics online.